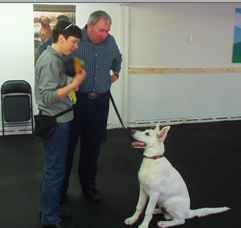 Did you know teaching your dog to sit can be more valuable than just teaching your dog to sit? It is the building block for more to come. Sit is one of the first and easiest things we teach our dogs. If you think about it as a foundation behavior and use it in the following ways, you will actually be building more than a reliable sit. It will help teach your dog to attend to you and look to you for information and guidance. Your first step is to teach your dog what sit means. You need to be clear and do several in a row, rewarding every sit to build a pattern, “SIT means put your bottom on the floor”. Is that the only thing sit means? I believe sit means more than that. Building a longer sit, a sit with focus, a follow me and sit and of course a sit for what ever your dog desires is what I recommend. it is also a gentle, clear way to build structure and rules. All you need to get started is a SIT!